When we bought our house last year, the backyard left a lot to be desired. 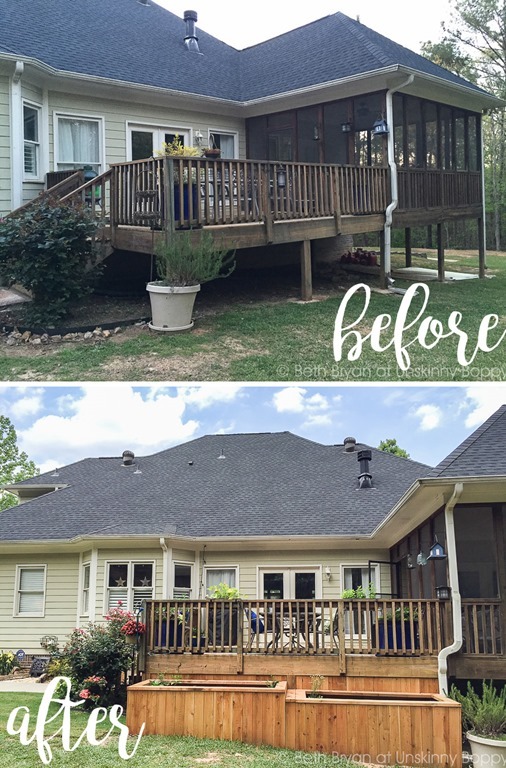 It was one of the major makeover projects I dreamed and schemed about over the winter as I waited impatiently for Spring to arrive. 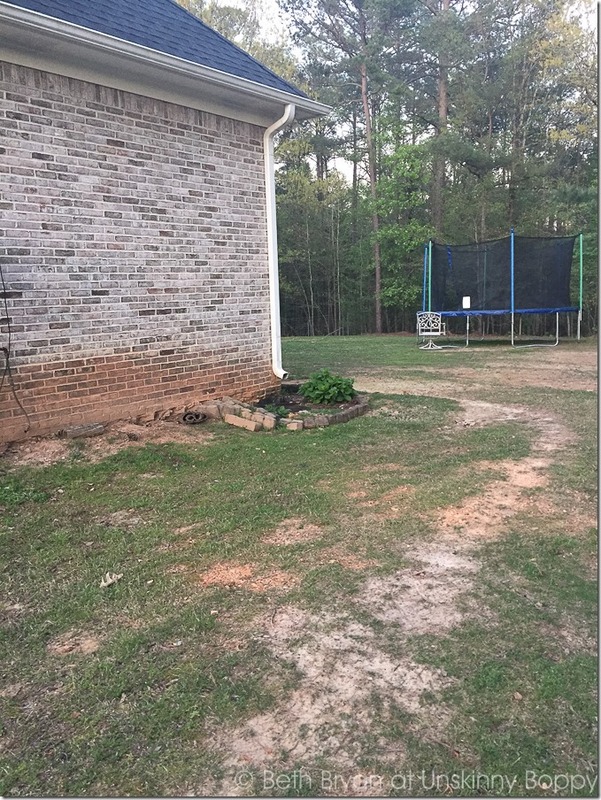 After months of imagining what the back yard could look like, I am finally able to report back with some MAJOR progress! Here is the back of our house before the makeover began. This shot was taken in winter so the weeds aren’t knee-high in the flower bed, but you get the picture. In a word, it was barren. 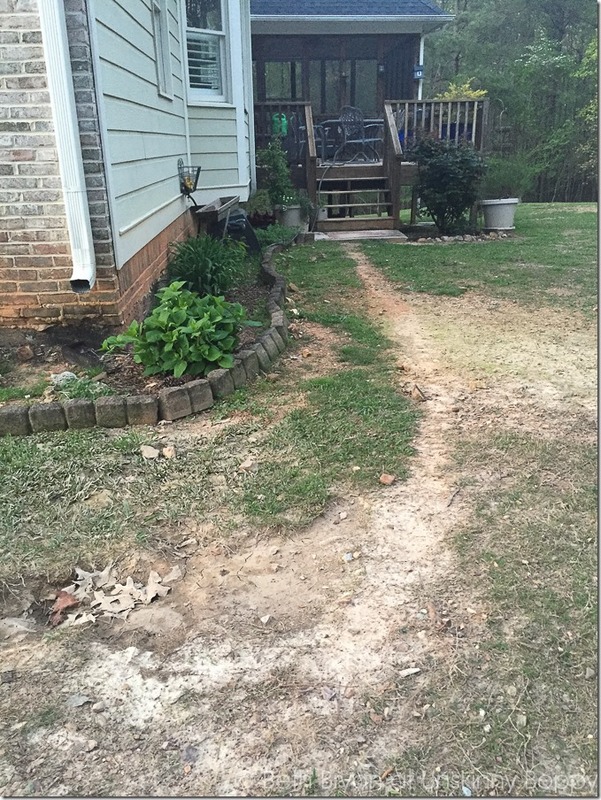 Over the past year the dogs had a well-trodden path worn from the front yard to the back. The grass was sparse because the ground is so rocky and hard. 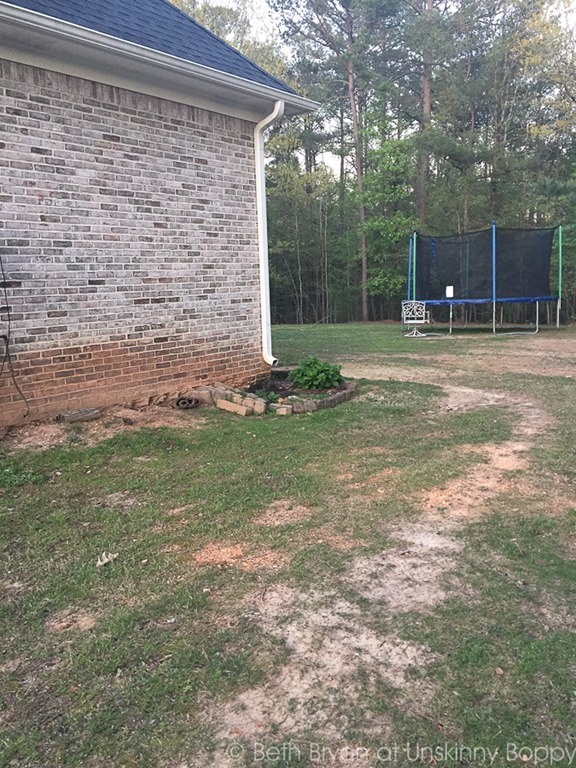 Approximately 20 years worth of Alabama red clay stained the bottom of the bricks on the house from all the rain spatter. Around back, the previous owners had carved out a little flower bed using edging pavers, but those had seen better days. 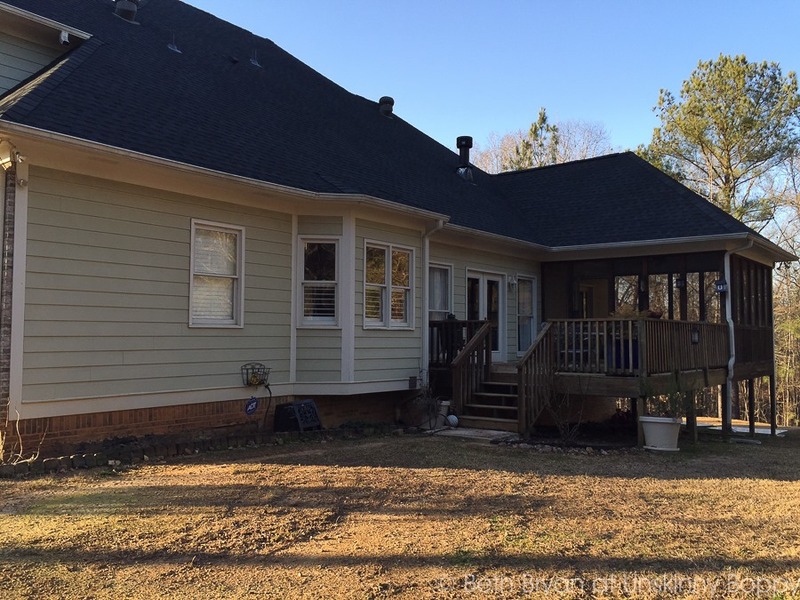 A huge mud-hole had formed in the low spot at the corner of the house. On the plus side, the house came with a well-established hydrangea, daylilies, a knock-out rose bush and a big ol’ patch of Greek oregano that had taken over the area underneath the bay window. 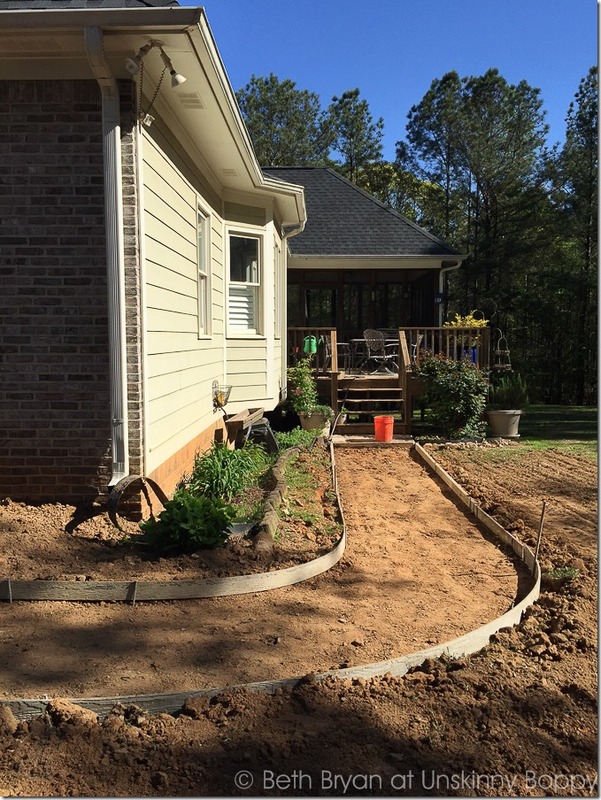 I was thankful to already have a good start on some landscaping with existing plants. At the very top of my wish-list were raised garden beds for planting herbs and vegetables. I scoured Pinterest for ideas, but this seemed like a bigger DIY job than I could handle alone. Then one day our local gardening guru Chris (aka The Redneck Rosarian) shared a blog post about the new raised beds in his garden. As soon as I finished reading his post I called the landscaping folks that he used to get an estimate on my backyard. Within a few weeks Stage One of Operation Backyard Makeover commenced! 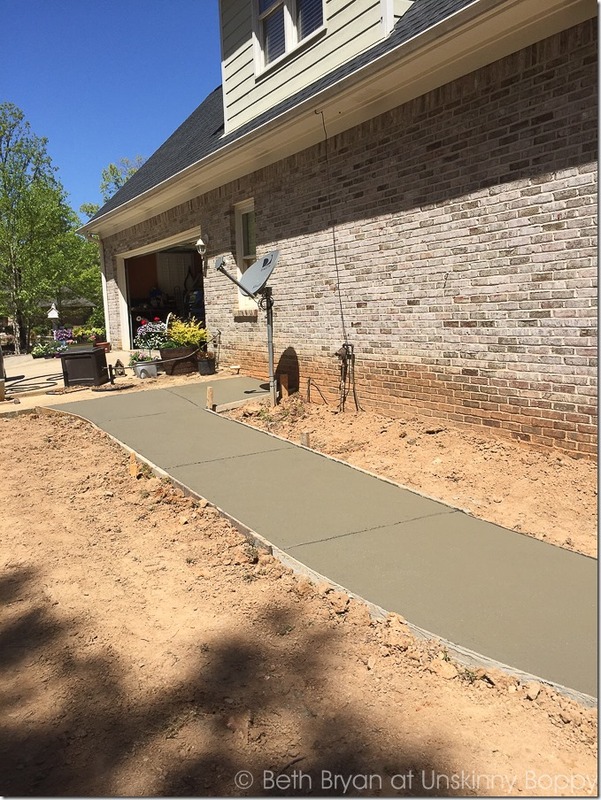 It all began with a crew bringing in a bobcat and a concrete truck to cover the dog-trot with a big, beautiful sidewalk. 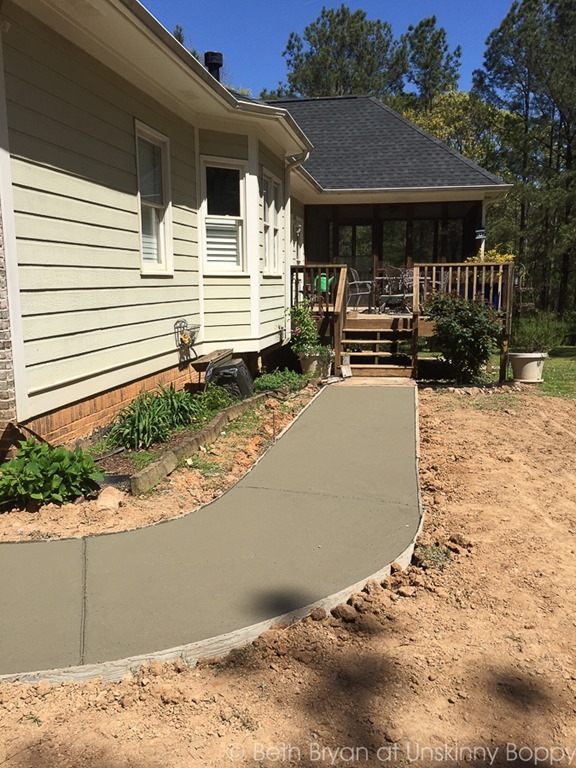 I got recommendations on a good concrete guy named Paul Woo who literally had this area completed within a single day. His crew did an excellent job. I also had them pour an extra little slab for us to park our trash can and recycling bin next to the satellite dish. That has been so nice to have a designated spot to get them out of the way. Next up Doc and Eric Hurt of Landscape 360 brought in their crew for Stage two of the backyard renovation. This project involved building fourteen(!!!) glorious feet of raised flower beds to enclose the back porch. The herbs I’ve planted are cilantro, lavender, basil, flat-leaf parsley, peppermint, and chamomile. I also have all sorts of veggies planted in here- Tomatoes, peppers, cucumbers, blackberries, strawberries, squash, canteloupe, even PUMPKINS! I have no idea how big some of those plants are going to get, but I am hoping to use my porch rails as a trellis for the bigger ones. I will let you know how that goes if I’m able to get to my computer through all the curliqued vines. One, two, three, four… guess who doesn’t have to bend over any more? I mean, I know that bending over is a great benefit of gardening and I still do plenty of it in the other flower beds….but I’m not as bendy as I used to be. So you gotta admit it makes things easier if I can harvest my veggies from standing height, right? 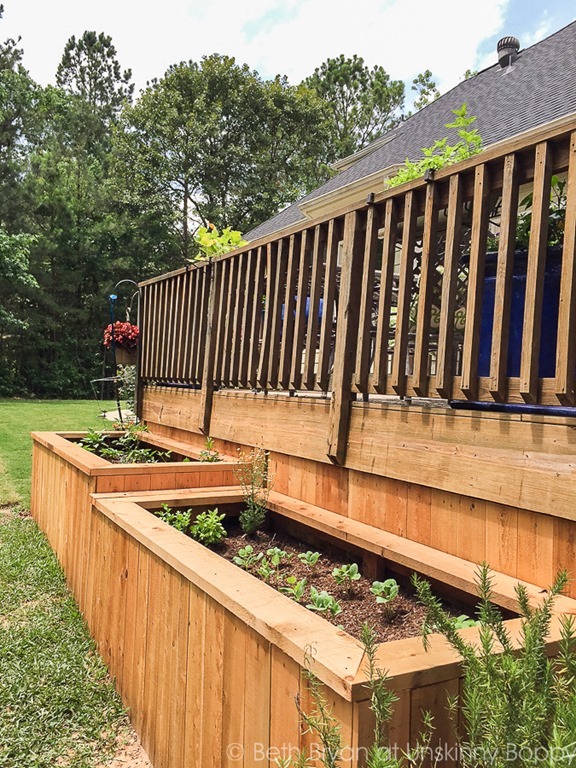 The raised bed dimensions are 14 feet long by 3 feet deep by approximately 30-36 inches high, depending on where I am standing along the edge. 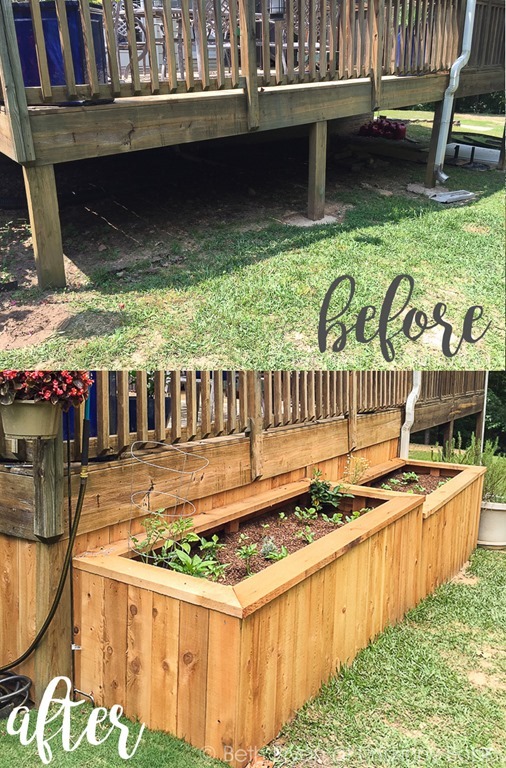 Since the yard slopes down quite a bit while the deck stays level, we staggered the beds so that one is lower than the other and they are the perfect height for me all the way down the length of them. Let me tell ya though, filling up those big ol’ boxes with dirt was a HUGE undertaking. First I tossed in every piece of sturdy non-biodegradable junk that I could find—old flower pots turned upside down, scraps of untreated lumber, big chunks of styrofoam and rocks that were dug up from the yard. All of that junk went in the very bottom to provide drainage and fill up some space. Then the landscapers shoveled in two truckloads (that’s 2 yards) of topsoil on top. 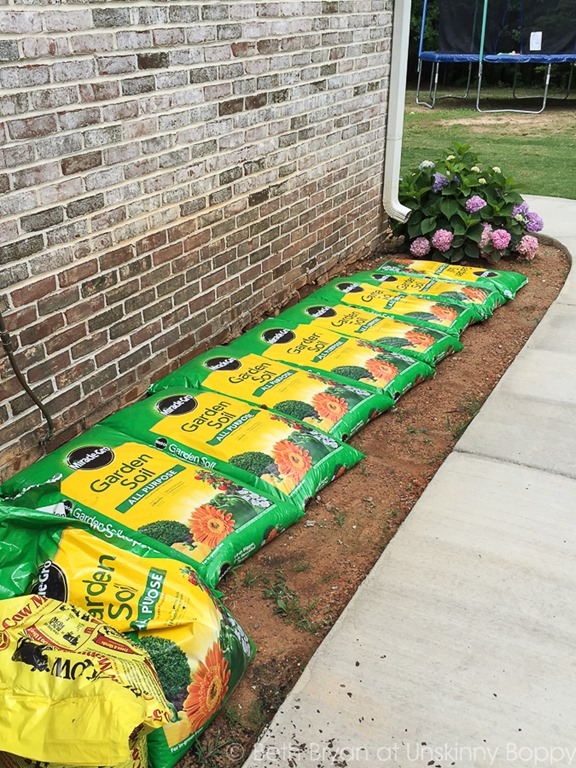 After the landscapers left I went to Lowes and bought a dozen 2 cubic feet bags of Miracle-Gro Garden Soil mixed with four 50 lb bags of Black Kow organic manure. It took a TON of dirt to fill these suckers to the top, but now that it’s done I will only need to top it off annually as the rain settles the beds down. Oh, and I used a few of those old garden edgers combined with some river rock to create a mini-pathway to my hose reel. Now I don’t have to worry about stepping on any creepy-crawlers that might be hiding under the foliage when I turn on the sprinklers. 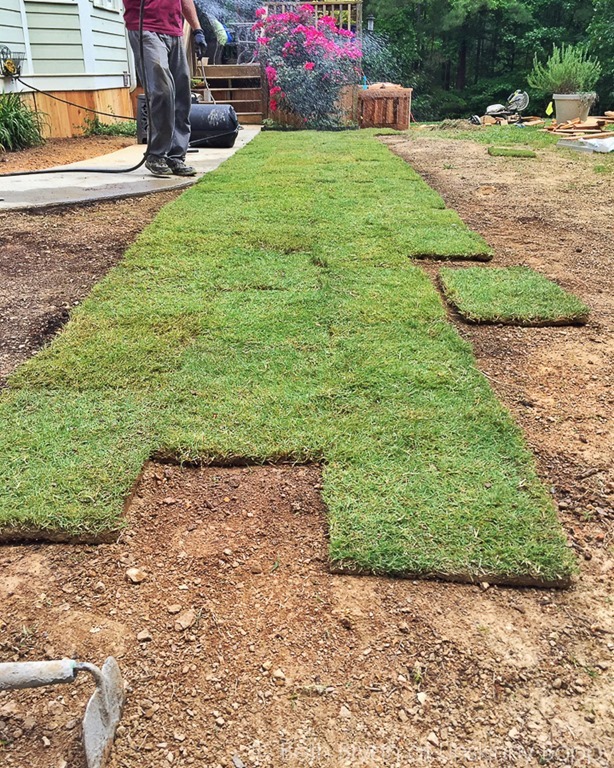 And finally… the final stage of the big backyard renovation…rolling out the Green Carpet! Three full pallets of Bermuda grass were brought in to cover the barren desert. 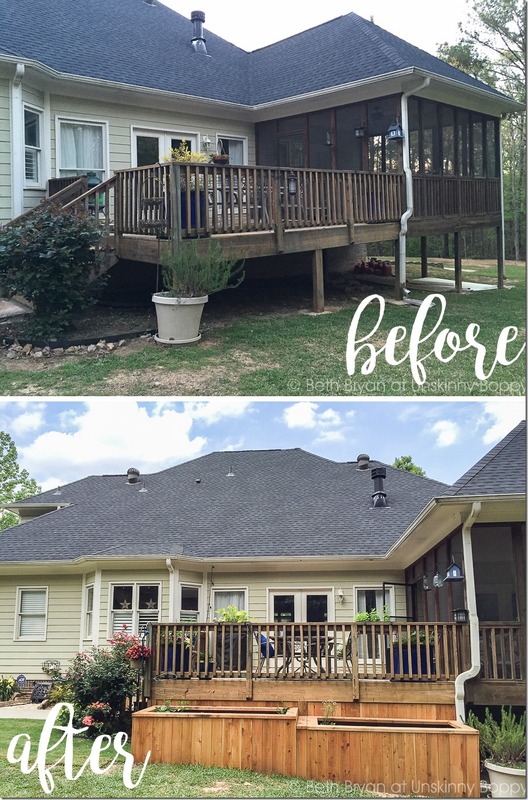 This was such a HUGE improvement! Oh I’m so in love with my backyard now! 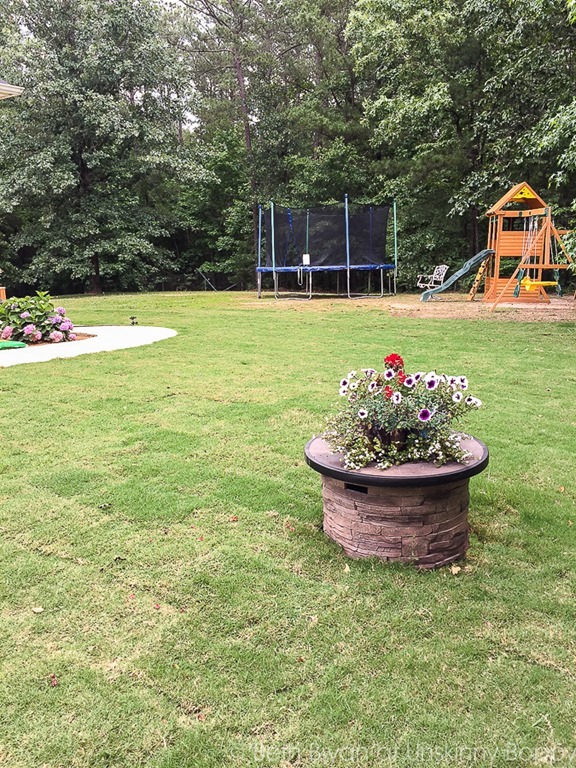 The kids have plenty of room to run through the sprinklers to the trampoline and swing set. 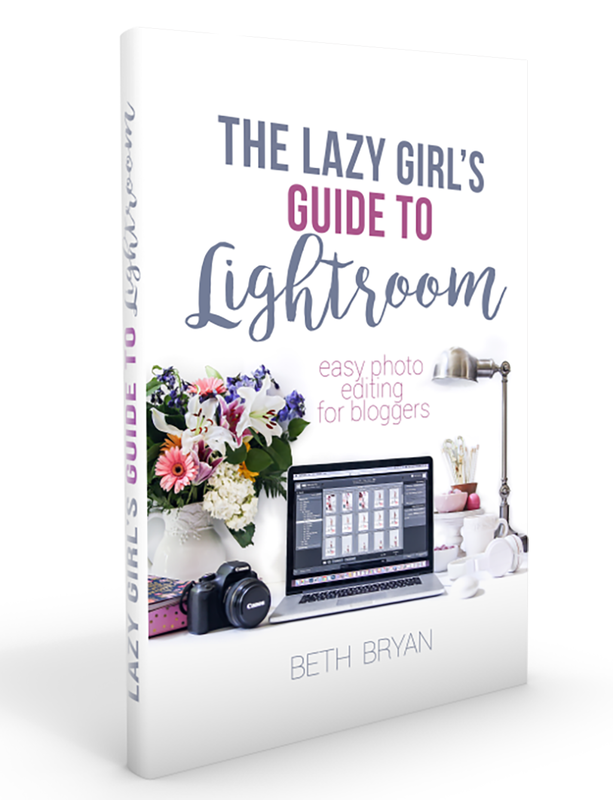 I know this is the longest post in the history of all blog posts, but let me show you one more thing before you go! We have this ugly propane tank buried in our yard that is such an eye-sore but it’s necessary since it powers our gas fireplace. To make it not so noticeable, I found this round rock fire table on sale at Target last week for a STEAL of a deal. It is hollow underneath, making it the perfect solution to cover the ugly lid of the tank! I just popped it on top and it looks beautiful! I will admit that I contemplated hooking the fire table up directly to the buried propane tank, but my dad pointed out that it might not be a good idea to have a fire burning right above the GIANT tank of gas buried in our yard. So for now I sat a basket of flowers on top and I have a pretty little plant stand! When we do want to use it as a outdoor fire pit we can easily move it and use it with a smaller propane tank in another part of the yard. 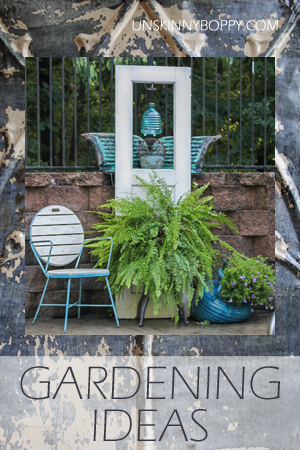 There are still LOTS of things on my backyard to-do list, including planting more flowers and adding mulch to the beds, but before I can do that, I have to do this…. So if you need me, I’ll be over here with my forty-leven bags of MiracleGro and the Garden Weasel going to battle against the awful Alabama red clay. 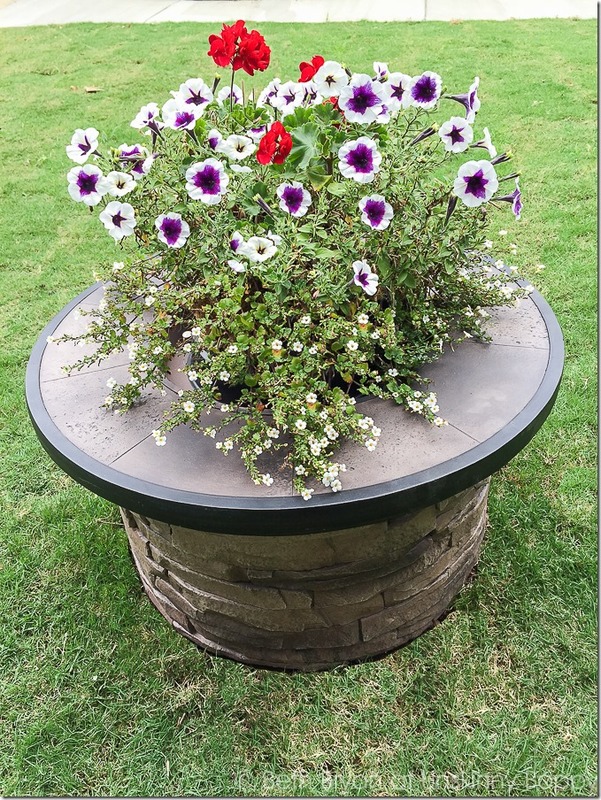 Check back for more updates on the final planted flower beds in a few months! I’ll be sharing my progress and my veggie harvest over on Instagram so be sure to follow along. Wow! What a transformation! 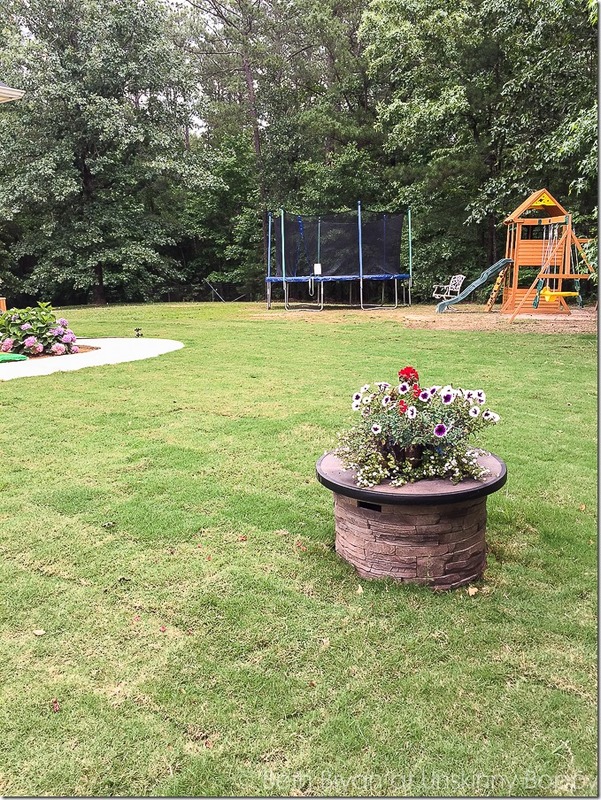 Your yard went from dull and shabby to a beautiful area. Whatever you paid was so worth it. I’m curious as to why you decided to fill up the planters with all that soil. Since you will only be growing small plants there, why didn’t you just build a plywood floor about 10 inches down from the top? That way you would only have to put in about 6 or 8 inches of soil. You would have to make the plywood floor very sturdy but it seems that would have been easier than putting so much dirt in each box. I’m also thinking that as time goes on, the dirt will begin to settle against the walls of each box and make it bulge out and the sidewalls eventually pop off. You’ll have to give us an update in 15 years, lol. BURY A PROPANE IS OUT OF QUESTION HERE.FOR IS NOT A UNDERGROUND TANK.MAYBE SOUTH OF THE BORDER WHERE NVER SNOWS.ALSO CLOSING THE TANK WILL ALLOW NO NEED FOR EXPANDING GASES TO ESCAPE.PRETTY SOON A TANK BURIED LEADS A SERIOUS SITUATION.TANK MUST RATED TO BURY OVER HERE IN CANADA OR WE WOULD TALKING TO SAINT PETERS ABOUT THE MISTAKES WE DONE IN LIFE. What a transformation. Looks great!! Absolutely lovely! Such fun watching the changes. Thanks for sharing. You’ve done a beautiful job! 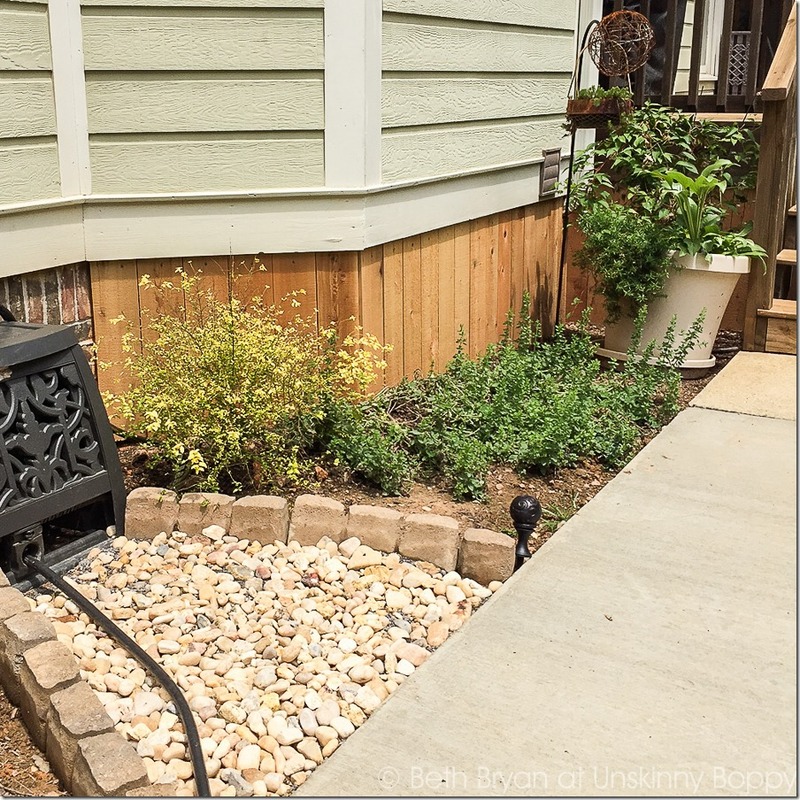 Be sure to stick a rain barrel under that downspout if your state allows you to collect rainwater! It will come in handy if you have a dry spell in the summer. I’m a raised garden bed kinda chick, myself. But I’ve built my own. I was wondering how yours are holding up. I find nailing lumber on the OUTSIDE of the supports tends, over time, to push the nailed-on boards out. With boards that thin, I’m thinking 2 or 3 years, not 15. But you an always do a decorative frame on the outside, given your corner supports are strong. I do mine horizontally, with cross pieces from front to back to hold it steady. 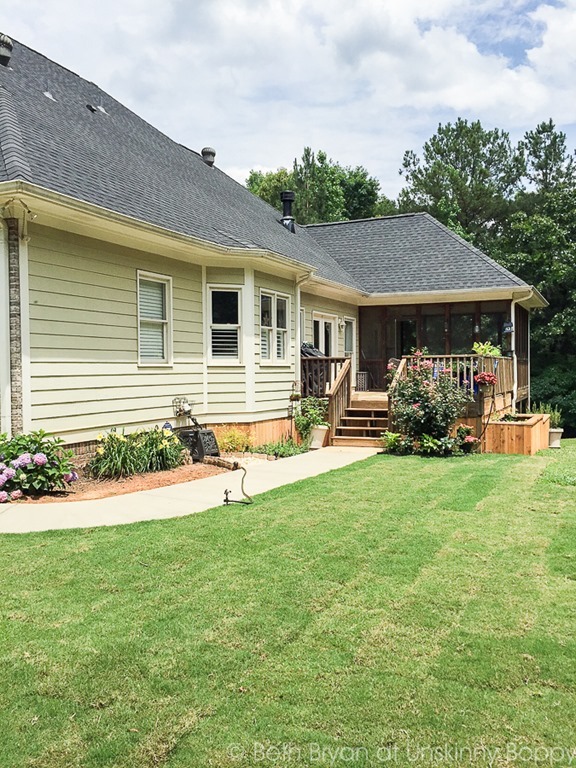 Reclaimed lumber treated with Eco-Safe. I love my beds and am creating a courtyard type area with them — and reclaimed pavers! You were smart to pad the bottoms of your bed. I use old bricks and even milk cartons filled with sand. Your type of gardening (not trees or shrubs) grow in the top 12″ of the bed, so don’t waste $$ on all that gorgeous top soil. Use it for the beds around your foundation. That soil looks unhealthy. You might want to consider soil amendments that are more aerobic for better results in your beds. As you “top off” in the fall, throw in some layers of “browns” such as pine fines, leaves, even layers of newspaper and old mail and magazine. 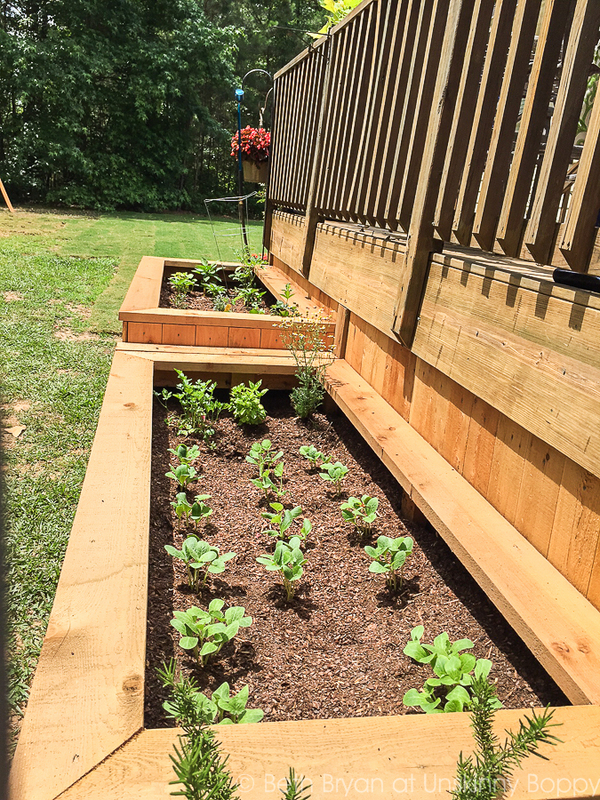 Top everything with leaf compost, mulch or even just wood chips and by spring you’ll have yet another layer of gorgeous soil. God might have made the earth, but I’m here to tell ‘ya this chick can make DIRT! Beautiful, healthy dirt. It’s called “lasagna gardening!” YEAH! I did laugh at your happiness at the Bermuda grass. My hair stood on end at the thought. Here in MD I’d love to kill that crap, since it grows up through EVERYTHING. Then I saw your clay soil and realized you couldn’t have put down anything better. Since you cannot kill it (I swear it’s an alien life form) and you didn’t amend your soil before putting down your grass, you need something that pretty much lives on air. It’ll also stop any erosion issues you have! Love the yard. It all looks fantastic esp loving the raised beds. Looking for a good way to hide going under my deck so I like what you also did there. GORGEOUS! I’M GIVING THIS A TRY! Beautiful job!!! Going to show this to my husband for our backyard! Thanks for sharing. You have truly inspired me!! 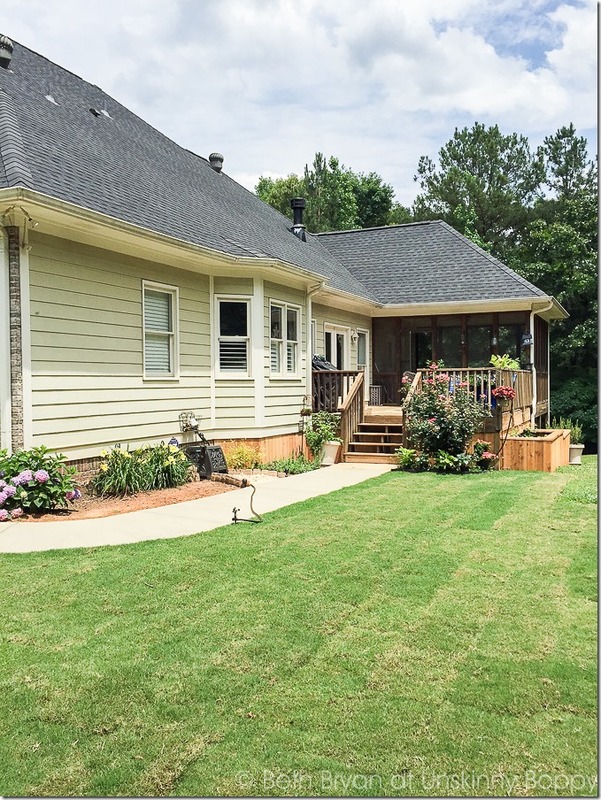 I will be moving into my mother-in-laws house and her NC backyard looks very similar to your Alabama backyard! Thanks so much for sharing, and inspiring!! I love what you did. EVERYTHING is absolutely fabulous. 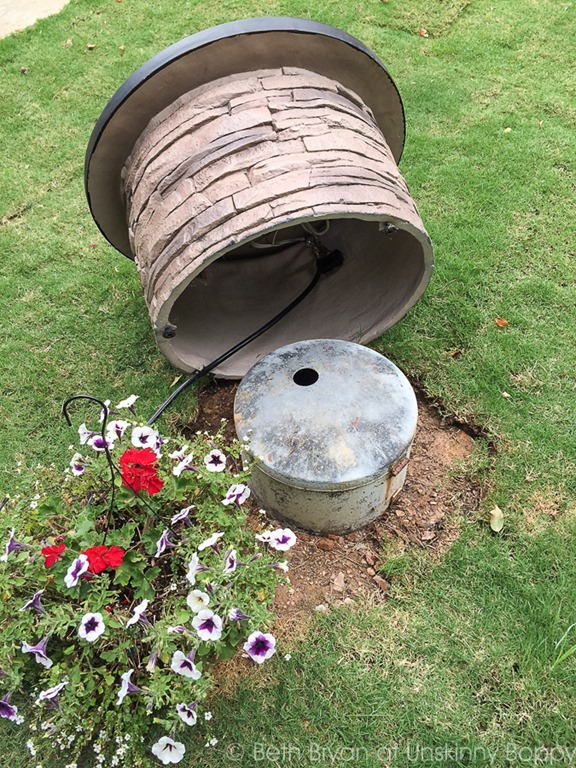 What a great idea using the hollow table to cover your gas tanks that stick out of the ground. I also love the creative way in which you added the potted plants on top. Thank you for sharing your gorgeous backyard. For those who can think about it, Hicks can create it.